Music in Rochester: ALWAYS in Tune! Hot, cool, rocking, elegant, bluesy, jazzy, danceable - Music flows through Rochester, N.Y.! 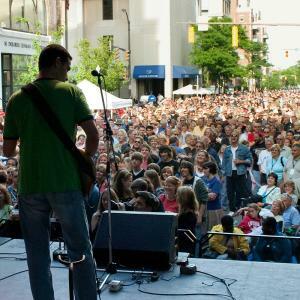 Whether you&apos;re in the heart of downtown, in the East End or South Wedge neighborhoods, at the Water Street Music Hall, or at the majestic Eastman Theatre, you&apos;ll find live music you&apos;ll love in performances almost every day of the year -- calling behind club walls and whispering from high-tech recording studios. Pulsing through city sidewalks in summer and throbbing between your toes at the beach. Music may suddenly grab you to get up and dance or shyly wrap soothing chords around you like a blanket in the winter. Rochester is alive with an irresistible rhythm! Eastman School of Music: "The hottest music school in America"
Grab a cappuccino and a pastry at Java&apos;s on Gibbs Street and you just may share the line with young musicians toting backpacks shaped like instruments. What&apos;s the history behind so much harmony? Kodak founder George Eastman certainly had a role. His love of music included hosting musical events in his mansion home and eating breakfast every day while listening to his pipe organ played for him. In 1921, he established the Eastman School of Music at the University of Rochester, now acclaimed among the best in the world and attracting top musicians from every corner of the globe. 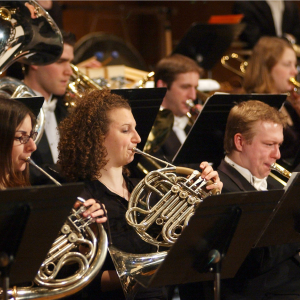 The Eastman School was recently named "the hottest music school in America" by Newsweek magazine. It&apos;s at the hub of Rochester&apos;s vibrant music scene. Its majestic Eastman Theatre, in the heart of downtown, is also one of the finest concert halls in America: home to an exciting array of performances from concerts by the acclaimed Rochester Philharmonic Orchestra to international guest artists and large-scale opera productions. 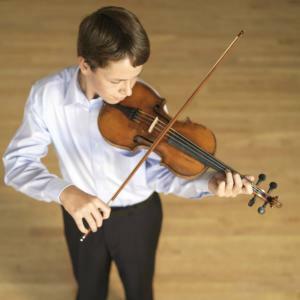 Chamber ensembles of every description plus solo performers and other musical programs regularly take the stage at Eastman School&apos;s acoustically perfect Kilbourn Hall or Kodak Hall, too. Visitors will find a performance featuring this school&apos;s excellent faculty, students or ensembles on one of these two stages nearly every day. Best of all: many of their concerts are free! Given the Eastman School of Music&apos;s reputation for outstanding programs in composition, scholarship and ensemble performance, it&apos;s no surprise that former students have performed in every principal orchestra in the United States, been nominated for Emmy awards, won Grammy awards, and produced recordings that reached #1 on Billboard&apos;s charts. In 2014, Grammy Award-winning Eastman alumna Renee Fleming became the first classical singer in history to perform the National Anthem at the Super Bowl. The Eastman Jazz Ensemble has won major awards from Down Beat magazine, while the internationally celebrated Eastman Wind Ensemble -- the first of its kind in America -- celebrated its 60th year in 2012 after producing numerous recordings and giving more than 100 world premieres. The Eastman School has also nurtured six Pulitzer Prize-winning composers; and its Sibley Music Library is the largest academic, music-research collection in North America. After visiting in the late 1920s, George Gershwin declared it to be "...the most wonderful music school in America." The New York Times has placed the Xerox Rochester International Jazz Festival as one of the top four jazz festivals in the U.S., on a par with San Francisco, New York City and Newport. The European style festival claims a large swath of downtown with shows in the Eastman Theatre, Kilbourn Hall and a variety of local clubs and other nearby venues. The surrounding streets are closed off, and the atmosphere pulsates as huge crowds of people come to enjoy the free jazz, blues and reggae concerts on several outdoor stages. More than 195,000 people attended performances in 2013. Jazz aficionados and other music lovers come to town for more than 300 shows by 1200+ artists -- from legendary performers (like Steve Martin, and Earth Wind & Fire) and familiar favorites to rising stars and new discoveries -- spanning nine days of both jazz and rock performances. In past years, big-name stars like Wynton Marsalis and George Benson have been known to unwind at the festival&apos;s hottest late-night jam sessions, too. The annual ROCSummerFest is another summer celebration. 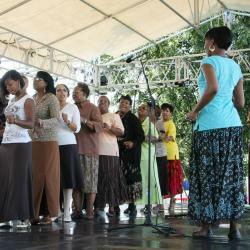 The Gateways Music Festival is a biennial event featuring classically trained musicians of African-American descent with more than 30 solo, chamber and orchestra performances in the Eastman Theatre, houses of worship, schools and other community locations throughout the city and suburbs of Rochester, New York. Juilliard-trained pianist and Eastman School of Music faculty emerita Armenta Adams Hummings is the founder of this festival, which seeks to" present chamber and orchestra music at the highest possible level." But even when music isn&apos;t the sole purpose of an event, nearly every festival throughout the area offers live music as part of the fun, even when the major focus is lilacs, arts and crafts, local waterways, ethnic celebrations, history, harvests -- you name it. Rochester loves a good festival! If nine straight days of jazz doesn&apos;t fill your cup - take heart! You can still find live jazz at places like the Venu Resto-Lounge in the St. Paul Quarter; while more adventurous jazz fans gravitate toward the avant-garde music that rules at the Bop Shop. The Bop Shop specializes in blues, jazz and American roots music styles like soul, rockabilly, surf rock and doo-wop, folk, plus Celtic and English folk, with a huge selection of LPs in all musical styles. Top alternative bands regularly rock the Water Street Music Hall, and emerging artists keep the Bug Jar hopping (get it?). Feeling bluesy? Head to The Dinosaur Bar-B-Que and Beale Street Café. Folk and jazz acts are right at home at Java&apos;s, a bohemian-style sidewalk café. And local cafés and quirky neighborhood bars jam with acoustical music. Rochester is said to be "big enough to get Springsteen, small enough to get tickets." Top national acts frequently touch down at the Blue Cross Arena at the Community War Memorial. Can&apos;t resist the sound of a drumline? Rochester has been the center of drum and bugle corps activity for decades. The Drum Corps Association brings their 50th anniversary and World Championship to Rochester in 2014 at Sahlens Stadium. But that&apos;s not all! There&apos;s no shortage of concerts showcasing early instruments and music dating from the Renaissance. Rochester is home to Madrigalia, an outstanding, 18-voice ensemble specializing in16th- and 17th-century madrigal. Imagine the soul-vibrating music of organ harmonies from the only full-size Baroque Italian organ in North America. Find it right here in Rochester! 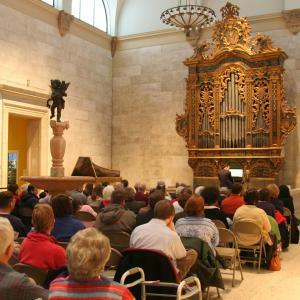 Originally constructed in the 1680s, it now resides in the Fountain Court of the Memorial Art Gallery on University Avenue, where visitors can enjoy Sunday recitals. The Eastman Rochester Organ Initiative formed a collaboration of the greatest organ builders and performers in the world, making Rochester the center for building, teaching and playing this impressive instrument. In Rochester, you never know who might drop by to play at local clubs and cafés all year. But a trip to the legendary music store House of Guitars is like a pilgrimage for some musicians: Check out the autograph wall for signatures from rock idols who&apos;ve made it a point to try out everything from guitars and drums to amps. Musicians also seek out Bernunzio Uptown Music shop, where vintage instruments are sold and repaired. Lehmann&apos;s Stringed Instruments has been bringing musicians to Rochester for its custom-designed, hand-made guitars and other stringed instruments since 1977; while Sullivan Violins specializes in creating, repairing and restoring violins and other stringed instruments, including violas that have won several "tone" awards from the Violin Society of America. More than a store the Record Archive, specializes in new and used music, vinyl and CD&apos;sas well as gift and specialties. You will also find two live performance stages with a regular schedule of performances. - William Warfield, whose rich bass-baritone made "Old Man River" a classic. Guitarist Gene Cornish emerged from the city in the 1960s to make rock ‘n roll history with the Rascals, and Rochester-born Lou Gramm ruled pop charts in the late-1970s and 1980s as lead singer of Foreigner before launching a successful solo career. Bluesman Edward "Son" House and entertainer Cab Calloway once lived and performed in this musical gem of a city. Rochester has a rich tradition of reaching anyone who wants to sing or play an instrument. The Eastman Community Music School serves students of all ages - preschoolers to senior citizens. Music-education programs at area high schools are frequently recognized nationally by the American Music Conference for their excellence. Rochester has even become a center of music-therapy expertise with several area clinics plus a top-notch training program at Nazareth College. The Rochester Oratorio Society is one of the many excellent, all-volunteer singing groups in the community. The 170-member chorus achieved distinction as the first non-Chinese choir to perform in the Great Hall of the People in Beijing as part of China&apos;s pre-Olympics International Cultural Festival. ROS was also selected to perform at both the opening and closing ceremonies of the 2008 Summer Olympic Games, a rare honor! Rochester is the home of many outstanding chorus groups, singing everything from classical, sacred, and secular music to folk. The phenomenal Rochester Gay Men&apos;s Chorus even sings lyrics by William Shakespeare and wows audiences with their variety of music styles. We&apos;re still not over the thrill of watching the University of Rochester&apos;s a cappella group, The YellowJackets, perform on the national television competition The Sing Off in 2011. Talented students, established professionals, organized groups of "hobby" performers. They all add to Rochester&apos;s astonishing musical tapestry. If music usually makes your heart sing, don&apos;t be surprised when you fall in love with Rochester, New York: a city with an absolutely amazing sound track!